I attended graduate school with an aspiring medievalist who dubbed her terrier Ecgtheow (nickname: The Edge). My first non-childhood pet was a beagle we adopted from a shelter. He'd been discovered dumpster diving behind a Howard Johnson's, and was christened Roscoe by his rescuers. Although we were tempted to name him after the location of the shelter (that would be Peabody), my spouse and I decided upon Duncan Roscoe Gromit. Our current dog, a dachshund-beagle mix with the ponderous title Scooby Oolong Cohen, has no medieval affiliations ... unless, say, Duke William of Normandy had an Uncle Scooby who has not yet surfaced in the archival records (if he does, we know that a friend named Shaggy will be discovered soon after. Both were probably incarcerated for shenanigans involving illicit substances like, um, hemlock or belladonna or something). My son has a spiny-tailed lizard named Spike, also not medieval, not even in a Mock Medieval way. Blue Tail is still deceased. The most recent addition to our menagerie: a tadpole on the brink of metamorphosis. Since s/he belongs to both children, they have been kerfuffling over what to call the little thing. At this point the small amphibian will likely be bear the enormous name of Feänor Santa Worm. Can you guess who is responsible for each segment? I hope Eileen won't mind if I reveal that she named her new dog Mr. Sparkles. What about you, readers? 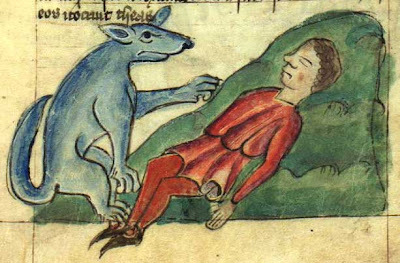 Have you given your animal companions medieval-leaning names? Not medieval, but I had a dog with a Jane-Austen inspired name: "Mr. Bingley," because he was "the most amiable gentleman of our acquaintance." I recently adopted a cat from the SPCA. The shelter had named her "Genesis," but this seemed to me to be a bit too pretentious and Talmudic for such a diminutive creature. She became "Jenny." I have to admit that, for most of my life, I have made a concerted effort to *not* give any of my pets names culled from medieval or other literatures. My partner, on the other hand, has dubbed all of her cats with names from Victorian literature: Wilkie Collins, Little Nell, and Oliver Twist [only Wilkie is still with us]. When I, at the age of 40-something, came into what could be called "my own cats," I named them Tom and Huck, because they were discovered in the swamp by the Pee Dee River behind our house in South Carolina but also because they would be moving to Missouri [hence, the Twain reference] soon thereafter. The name "Tom," for a cat, can sometimes be embarrassing, though, when you go to the vet and they ask what your cat's name is, and you say "Tom," and they look at you, like, "is that the *best* you can do?" Then I feel compelled to explain it's really Tom Sawyer and he's a river cat, and oh, just forget it. And yes, I have a new dog named Mr. Sparkles: that's his formal name. His "birth certificate" name is Sparky Pierre Joy [Pierre because he's French: a Papillon]; his royal title is the Earl of Sparkleville; and his street name is Sparky-J. He's a shelter dog, as all our animals are [we also have two other dogs: Georgie and Sophie, and I couldn't even tell you why we picked those names, seriously, but I think we obviously have a vested interest in dog names that end in the "ee" sound]. But my biggest confession is that, deep down, I really *do* want some pets with faux-sophisticated literary names, and I already have them picked out for my next two cats, when and if I ever find them, and I hope they will be brothers, because I want to name them Sebastian Flyte and Charles Ryder, or Sebastian and Charles for short. But for now, in Saint Louis anyway, it's Tom and Sparky [Huck died this past fall after being hit by a car, and yes, it's my fault]. If we get a dog and it's a male, Bullock wants to name it Gustavus Maximus, Gus for short. Bullock's great-grandparents hail from Sweden, you see, but Gus is a reference to what he calls Gil Grissom on CSI because he can't get his name straight and he knows it sends me up the wall. *I* want to name a dog Havoc -- as in "Cry havoc and let slip the dogs of war!" -- but Bullock thinks that's a self-fulfilling prophecy. If we get a female, she'll be named Gertie. Just because. I'm not sure why there are no males on that list. The only creature I ever gave a medieval name was a wee, friendly, and heart-breakingly cute black kitten whom I named (ironically) Grendel. Unfortunately his short life was snuffed out tragically by a pair of dogs I was dog-sitting (I didn't know they were cat-killers). One of them was named Boniface, but he was owned by a lawyer and not a medievalist. "It's true, Jennica. You and I, and all people, like Mozart. Let me see the fellow's face. I need inspiration." "He's hiding from you because he thinks you don't like him. How about Ludwig?" "We could call him Camille." "But he's a boy, Arnie." "So was Saint-Saëns. Whose music you like, and whose first name will not sound like a...deliberate allusion." "But what's the point of naming the cat after something if no one will get it?" "Because if you name a cat after something, and if people get it, then they will know you named your cat after something. A fact that would be humiliating. How about Knudage? After Knudage Riisåger the Danish modernist." It goes on for a long time....they eventually settle on "Mumpus." Our eldest male cat is Abelard because we found him when he was older and he hadn't been castrated, which we promptly did but in probably a nicer fashion than that experienced by the other Abelard. Our dog Owen is named after Owain Glyndwr. I've always wanted to name the animals in my family's house after medieval characters... but to no avail. 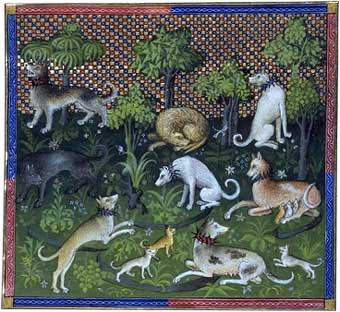 In fact, I was never able to name any of the family animals in childhood--perhaps because of the medieval penchant. I wanted to name my dog Beowulf, and a cat we got afterward Grendel (would have been a great pair, I think), but it was a no-go. The dog became Ringo, and the cat subsequently lost out too. Perhaps, now that I'm on my own, I'll be able to name my own pets. But I'm pretty sure that power will be usurped upon starting my own family. Not that I'll ever really give up on trying for the "sophisticated" allusions in pet names. I've named two dogs in my life -- Kit and Allegra. I named Kit when I was seven, because my neighbors kept this particular dog even though we found it (my mom's allergic to animals). I wanted to name her Katherine. After myself (full name: Mary Katherine). My mother talked me into Kit. At 12, I was responsible for naming our family's dog, an Italian Greyhound whom on our first meeting ran around in fast circles in the little "getting to know you" room that was in the pet store. I suggested Allegra (thinking that the musical reference to Allegro was awesome). We now call Allie by a number of names, including Legsy and Miskabear (no clue where my little sister got this). My favorite nicknames for her are kind of medieval -- I tend to call her the Doge of Venice and Dogo son of Frodo (despite the fact she's female -- and Dogo was, unless I got it wrong, actually Frodo's father in the LOTR series). I'm glad to report Allie hasn't disowned me, despite the nerdiness implied by my names for her. As well as being a medievalist, I am also the daughter of a medievalist, and the household I grew up in often included pets with medieval names. A pair of cats named Lancelot and Galahad, another cat named Guenevere, a dog named Grettir, and bantam chickens named Chantecler and Pertelote come to mind. It wasn't just the Middle Ages though. We also had dogs named Gertrude Stein and Heinrich Heine. In college I had a pet mouse named Beowulf, who actually did die fighting a monster (my housemate's very large dog, who broke into his cage one day). Nomen omen! As a kid I had a guinea pig named Aisha, but since my parents had some Turkish (thus Muslim) friends, it was decided that it would be best if I changed her name before anyone got offended by it, so I chose Emilia, which I got from the Knight's Tale. No medieval names for me. The first animal I named was Barnabas (owing to my early crush on the character from *Dark Shadows*), but since then I've tried to be a little more, uh, organic. Above all, I steer clear of medieval Stuff, despite my family's best efforts to provide me with calendars, stationery, etc. proclaiming my (to them) identity as a medievalist. And I think that's the thing: I'm not a medievalist, really. 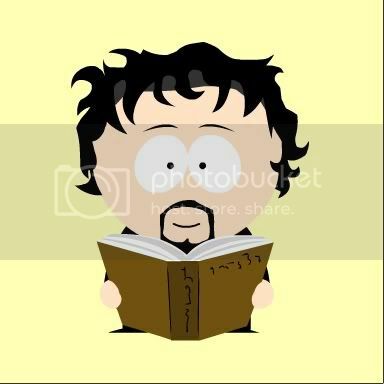 I teach the Middle Ages (along with graphic novels, the Bible, theory, and a bunch of other things), I research and write on the Middle Ages, and I am even primarily interested in the Middle Ages, but I am not really a medievalist. Ergo, no names, no tchotchkes, no decor. Just a lot of books. The current cat is Voiceover, due to his narrative inclinations. My brother named our parents' latest dog Loki. It doesn't really suit her, she's a sweet and rather fearful dog. Medievalists aren't the only ones picking funny names: my Greek teacher called her parrot Alkibiades! Like Eileen I tend to avoid medieval pet names and Christmas cards (well to be honest it never occurred to me to give a pet a medieval name). Our present cat was named by my son - and he was partly inspired by TSE's Old Possum - the only cat I ever named was called Pip - because she was apple-pip coloured and very small. As a child I had quite a few guinea pigs - all male - and all given 'proper' boy biblical names, likewise our dog. Strangely my fondness for these pet names lasted so long that I even managed to name one of my own offspring after a former guinea pig. He is very proud of this fact. Perhaps he should talk to Karl about human/animal interfaces. Enlightened? Passionate medievalist here - rather the female version of Indy's father (I have, actually, created my own hand-inked Grail Diary...) - and I write for a fantasy world creation site inspired by the works of Tolkien and set in a medieval/renaissance era. Our third was an elegant slim lass with needle-sharp claws who we dubbed "Bodkin" (again, more Shakespeare than Chaucer). Not medieval, but literary, in a sense ... I've always wanted to name a cat Spondee. My dream almost became a reality, but ever since I moved in with my current roommate, who has a cat (named Saturnine, after the emperor Saturninus in Titus Andronicus), I discovered that I'm more allergic than I thought I was. Maybe someday they'll come up with a cure for allergies, and then I can inflict poetic names on my pets.